Sansin Aqua-Gard: One coat protection for concrete and masonry. Like wood, concrete and masonry need to be protected. Even inorganic materials such as stone and masonry are susceptible to water absorption which (especially in colder climates) can cause extensive freeze/thaw damage. Sansin Aqua-Gard is a water-repellant coating engineered to protect new and existing above-ground concrete and masonry from weather damage. Aqua-Gard bonds with inorganic substrates to create a protective barrier that prevents water absorption and resists contaminants. Unlike paint, it won’t peel since it penetrates the substrate to protect from within. Aqua-Gard is water-based, clear, odorless, and won’t discolor – it can even be tinted to act like a stain and match the color of your project. 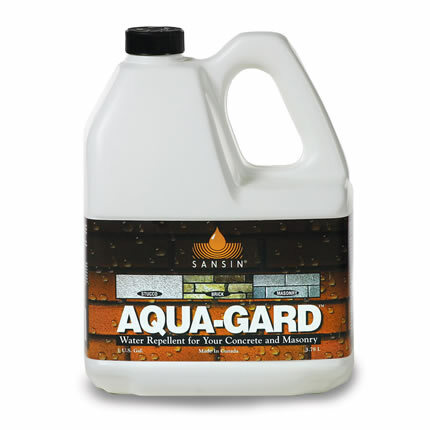 Because it repels water so aggressively, Aqua-Gard also works to protect reinforcing steel from corrosion. Sansin Aqua-Gard is suitable for brick walls and chimneys, stucco, roof tiles, concrete and masonry. Aqua-Gard is also available in 5-gallon pails. View the Aqua-Gard Product Data Sheet (PDF) for information about application, preparation, maintenance, and more. View the Aqua-Gard Safety Data Sheet (PDF). Sansin ENS Optimum Clear: A clear top-coat for maximum performance. Sansin Timber-Tec Seal ‘n Hide: Protect your logs and timbers from water intrusion. Classic Naturals Topcoat: Highly water-repellent finish and maintenance coat.